This is a mystery about this Parish. Various people have given thought to a route south over East Moor in the last millennium towards Rykneld Street which although originally a Roman road persists even to this day as parts of the A61. Such a route is discerned with less and less certainty as it approaches the Amber. The only firm starting point is above Holymoorside and a reference to Hereward Street, the rest is conjectural. We need to envisage the area before the Enclosure Act which so changed this common land, for example, in Lea and Wheatcroft in 1777 and an era of travel at a walking pace before motor cars and dual carriageways. It would help if we could identify predominant loads and direction, for instance, salt from Cheshire or lead to Bawtry but we cannot. Hereward Street raises issues of relating documentary evidence with artefacts on the ground in both time and place. 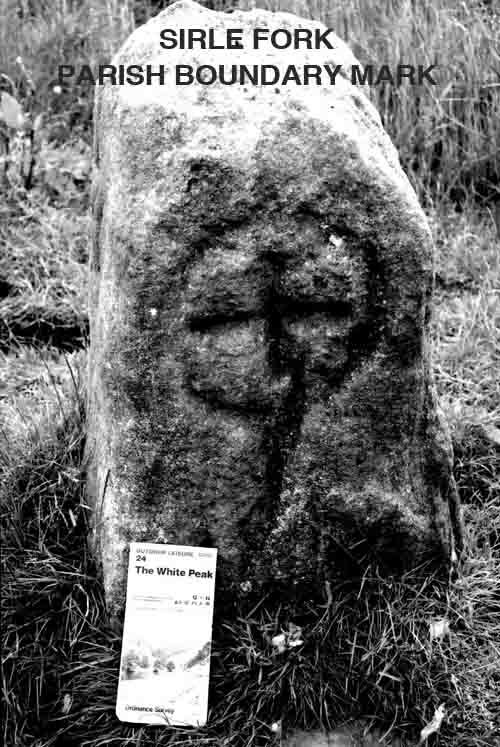 Adrian Henstock, writing in the Derbyshire Archeaological Journal (1970), discusses the matter. The only early references to it are in four 13th century documents defining grazing rights for Harewood Grange near Holymoorside. These refer to Hereward Street at Sirle Forke (a parish boundary mark still used in 1722, sirle, churl and possibly Charles being cognate words. Hereward was of course an Anglo-Saxon name and 'Street' implies a paved route.) It can be confidently placed to the SW and adjacent to Harewood land. Shirle Forke is drawn onto two Ashover Parish Boundary sketch maps (1687 & 1703). 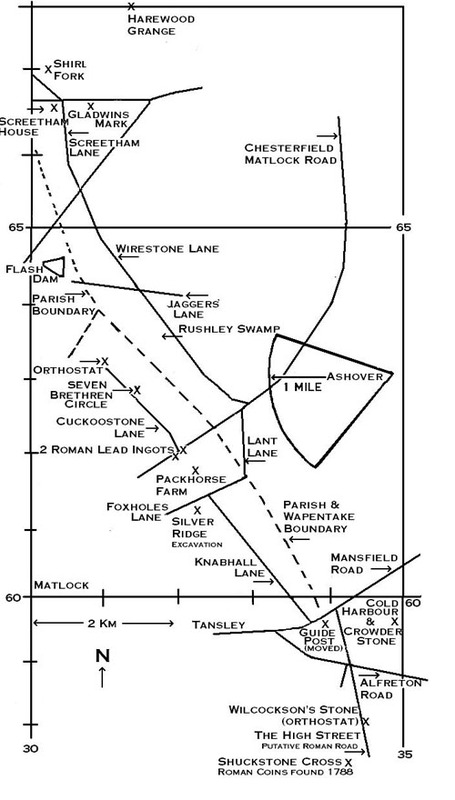 A stone called Charles Fork is named in a review (1635) of Beeley parish boundary near Darley Flash in a place where Ashover and Beeley parishes are juxtaposed. It is therefore almost certainly in the neighbourhood of Shirle Forke (variously spelt, Sirle, Shirl, ...) and may simply be the same landmark. So starting from Sirle Fork can we trace a route to Rykneld Street? East Moor has long been a wet, featureless moor and unless paved roads were established and then persisted, routes would be ill defined and changed at times for, perhaps, a presumed drier line. The route can perhaps best be defined as being 'within a corridor' over so-called 'Wet Moor' rather than 'along a line' and East Moor is narrowing here so the NE and SW scarp edges delineate the higher ground. This area is between the Amber (Hodgelane Brook) and Bentley Brook and would have some drainage at the edge and sparse, smaller trees and thus suggest the corridor. Boundaries in such featureless areas often coincide with roads, tracks and footpaths. It is now the boundary between four parishes, for instance the parish of Ashover with Matlock. As well it has been one between Wirksworth Wapentake and Scarsdale Hundred. It may even have been the boundary between the kingdoms of Mercia and Northumbria. The alignments of straight lengths of roads draw attention to them and we might consider two, on either side of the moor. With that in mind Cuckoostone Lane, Knabhall Lane, Packhorse Farm and Harland Stone [a guide post variously named, dated 1709 and wrongly moved to its present position at Five Lane Ends] lie just above the SW edge of the moor. [At "Silver Ridge" an excavation in about 1970 reportedly found a road thought to be Roman. Unfortunately no report can be found and therefore the precise location, orientation and finds are not known. It could be on the line we are considering.] Wirestone Lane and Lickpenny Lane are on the NE and thus they are within our "corridor". Both join up with High Street [aka High Street Lane] suggested as an early, possibly Roman, road. This is close to Cold Harbour, a name found on Sanderson's map of Derbyshire (1836) and the original 1" O.S. map surveyed in 1840. Such names are often found on Roman roads when 'harbour' derives from 'here-beorg' or 'army camp/shelter'. Place name experts however seem to be saying that there are numerous cases where such names occur on hilltops and simply mean 'shelter' as in the coastal usage. Can this site be considered a "hilltop?" An Anglo-Saxon inhumation was found near Overton Hall. The route can be tentatively continued past Shuckstone Cross, along Shuckstone Lane, Dark Lane, Plaistow, Hollins Farm, Potters Lane, to the South Wingfield area and crossing the Amber, say at Weir Mill Farm, to join Rykneld Street at Four Lane Ends. It is in this part, in Crich Parish, where things are most ill-defined confused as they are by local routes to Church or Chapel, to market and to work such as mines. Seemingly one of the few clues is Hollins Farm if it was, as might reasonably be supposed, an overnight stop for pony trains. Alas, there are no known contemporary accounts of the daily life of packmen. Dark Lane, a name used in that area, is another name for an ancient holloway. Wingfield Park can be expected to obscure ancient trackways if the owner acted autocratically as Babbington did at Dethick. The presence of 3 mills on or near the Amber may well hide crossing points which could give a clue. There has been extensive modification of the water course by weirs, dams and leats. Perhaps fishermen have noticed something? One does however have the feeling Park Lane knew where it was going as it negotiated dwellings, enclosures and contours. But then maybe the route went via Bull Bridge! There are other complexities. Parishioners in Tansley walking to Crich used the tracks such as the one by Green Lane, past the wayfaring cross at Cross Lanes, along the holloway alongside Shaw Lane and the somewhat hollow track [where a date stone at a stile records JC for John Cowley] from Lea to Upper Holloway There was a cross erected on the moorland on the boundary between Upper Holloway and Crich. The name of Causeway Farm in Plaistow might be of significance but may equally be on a route known to go east west. It is all an exercise of much imagination, some [but little] data as hard evidence and disputable analysis, perhaps most of all round Crich.